Can you attend the rally at the FCC on Feb. 26? Can you attend the VICTORY for the Net Party at Lost Society on Feb. 26? FCC Chairman Tom Wheeler wants to do something monumental: Reclassify broadband under Title II of the Communications Act. Translation: Everything you've done to get real Net Neutrality has paid off. And it’s time to celebrate! 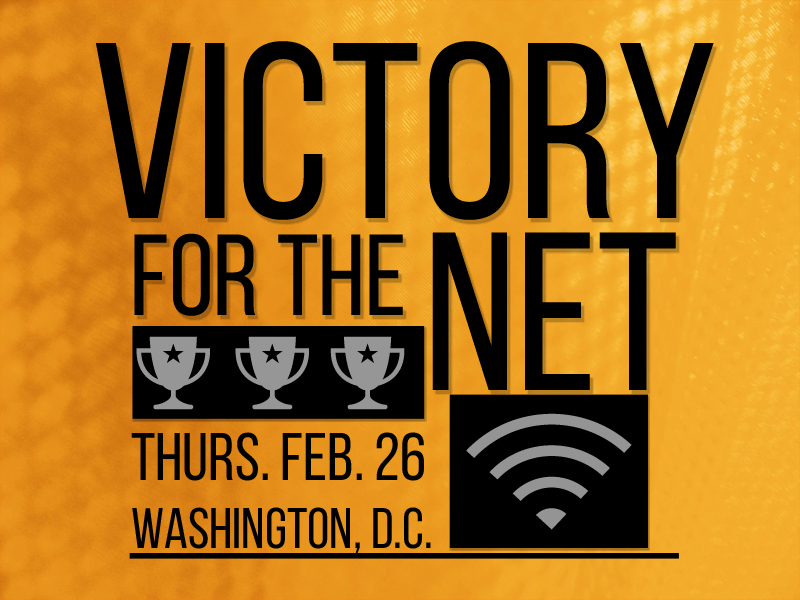 Please join us for two events in Washington on Feb. 26 — the day the FCC's voting on Wheeler's plan. 9:15 a.m. rally at the FCC: Over the last year you and so many other activists have shown up at the FCC to demand real Net Neutrality. Let's return to the site of so much activism to make our voices heard one last time before the big vote. The FCC still has to vote on Wheeler’s proposal and we don’t know the exact outcome. What we do know is that we’ve all worked hard to dramatically shift the landscape at the agency. And that's something to celebrate. Please join us for these two events in Washington on Feb. 26. We will send you more details once you RSVP.